Our education program is designed to support children's development by enabling access to education. Without the skills to earn a living they are likely to re-enter the cycle of poverty once they become adults. By ensuring that the children our partners work with have the opportunity of a good education, we hope to break that cycle. Our program focuses on improving access to education and resourcing our partners who operate schools. Some of our partners work with orphans living with guardians in the community and others run children's homes offering holistic care. 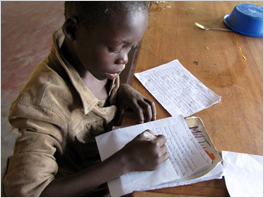 In both cases, our education program provides financial support that enables the children to attend school. Free education is rare in Africa, and our support covers help with purchasing text books and uniforms, as well as paying school fees and exam fees. We also support schools and vocational training programs that allow young people to learn skills they can use to earn a living. In Uganda, our partner offers IT skills training classes for orphans and disadvantaged youth, and in the DRC a primary school for local children operates at the orphanage.